If you are thinking about changing up your style a little bit, but don’t really want to lose too much length, you should consider adding some bangs to your style. All types of fringe are great, but in 2019 the most popular style is certain to be the wispy bangs. There will be a style of these light and airy bangs that suit all face shapes and hair textures. 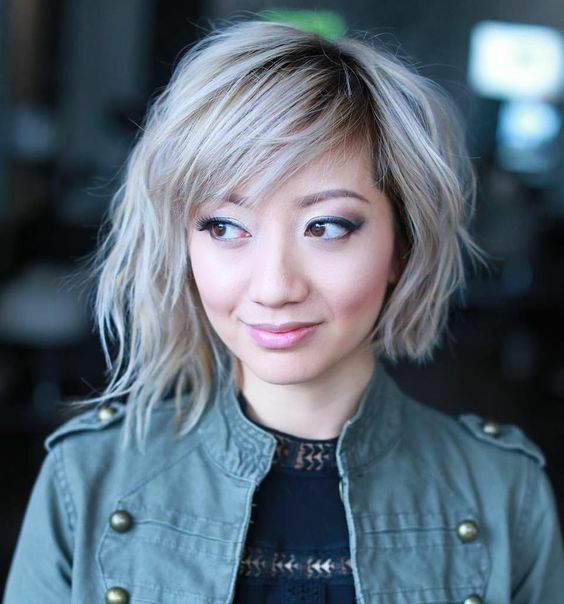 If you need some inspiration, check out some of our favourite wispy bangs styles. This way bob is so beautiful. 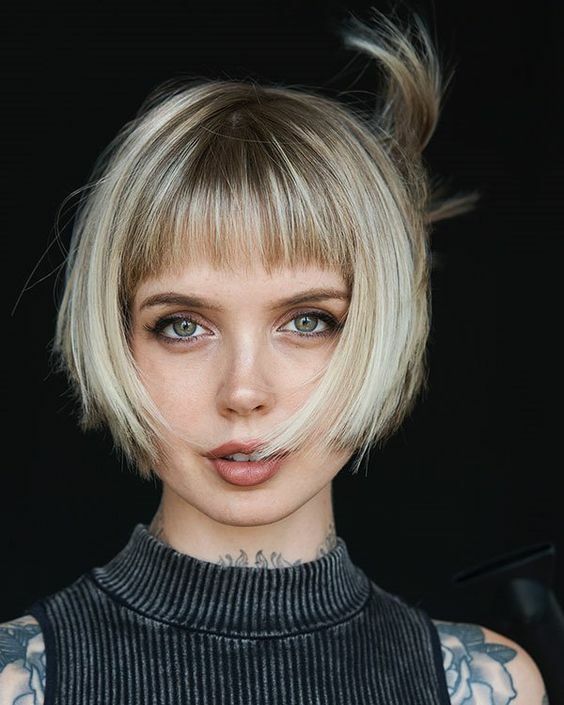 With some of the waves tucked behind the ear gives the bob a adorable elvish feel, which is added to with wispy bangs that reach to below the eyebrows. Use a light matte finish wax to tease out sections of the bangs to create a wonderful piecey effect. 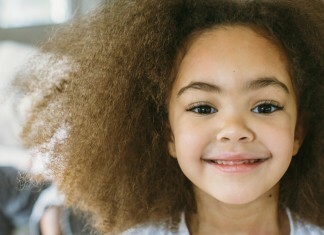 These long layered locks are beautiful – thick and full of life. 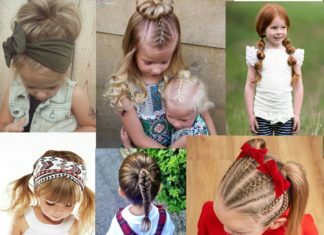 However, thick hair can easily look weighed down, especially around the hairline. Take out some of the weight with some gorgeous wipsy bangs that skim the eyelashes. 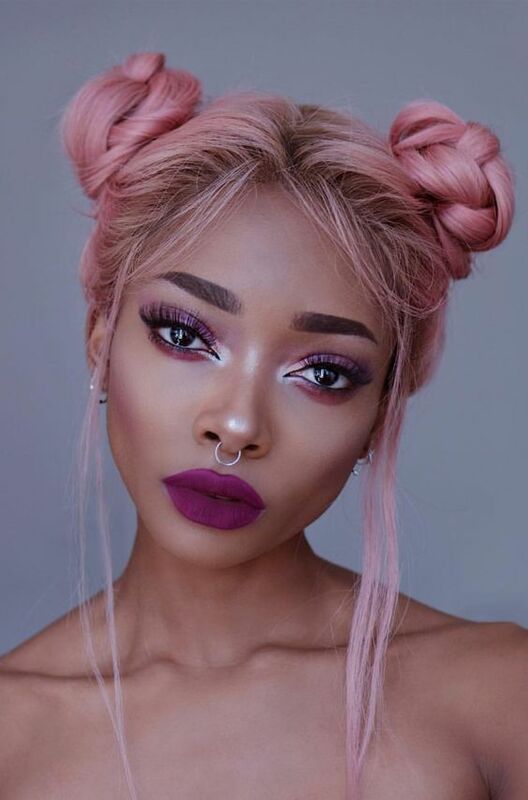 The dark colour our the hair almost works as a frame to draw attention to the eyes, making them pop beautifully. Effortless and carefree, this ponytail style embraces a gorgeous natural wavy texture, right down to the bangs. The bangs have been left with their natural wave, which looks gorgeous, don’t you think? 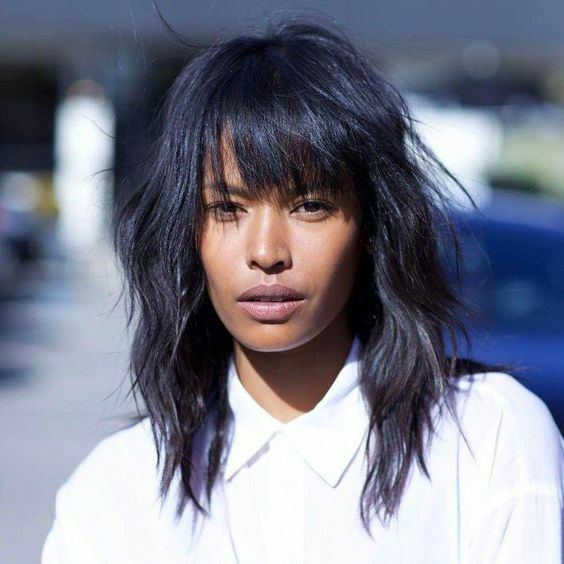 Wispy bangs are great for fine hair as they can be as sparse as you like and still look stylish. 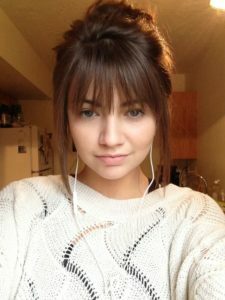 A full fringe may take out too much weight from your hair, but not wispy bangs. 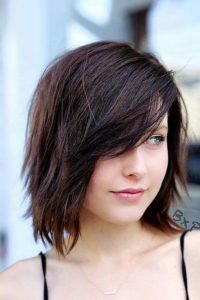 This sleek bob is gorgeous in fine hair, cut just to the collar bone and kept straight through the lengths and just slightly teased out at the tips. 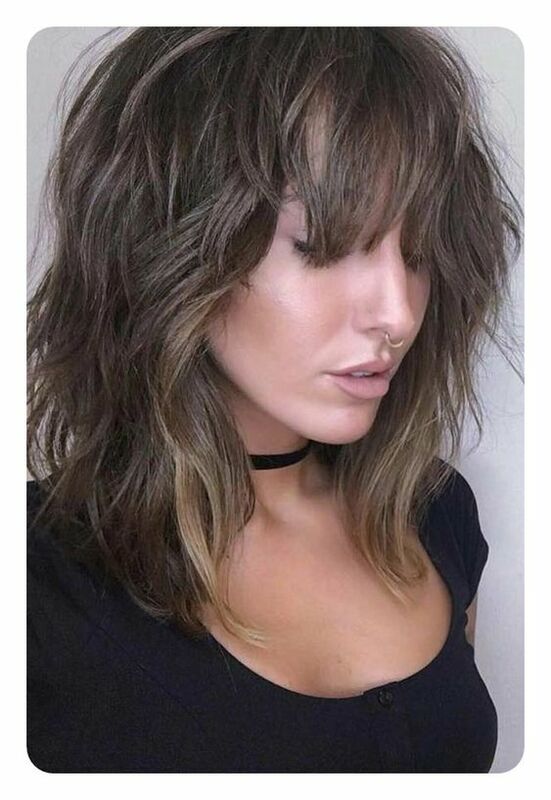 Shaggy layers are set to be a big hair trend in 2019, and it is not hard to see why. The loose layers create volume and movement in finer hair, or can take weight out of heavy, thick hair. This shag cut is so stunning, and the wispy bangs are so light and airy. A dreamy cut that is a contemporary take on a 1970s classic. 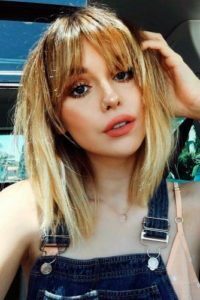 The tousled beachy texture of this honey blonde lob is too die for, as are the slightly grown out wispy bangs that fall randomly over the face. 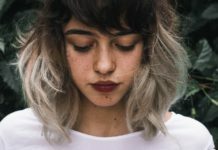 If you want to give your bangs the beach treatment, invest in a good quality sea salt spray, and spritz damp hair liberally with it. The asymmetric bob is an edgy style that is always on trend and looks gorgeous when styled with tousled waves. The side swept bangs add a touch of fun and will give some softness to an angular face. The silver colour is divine and the dark roots help to add depth to finer hair. 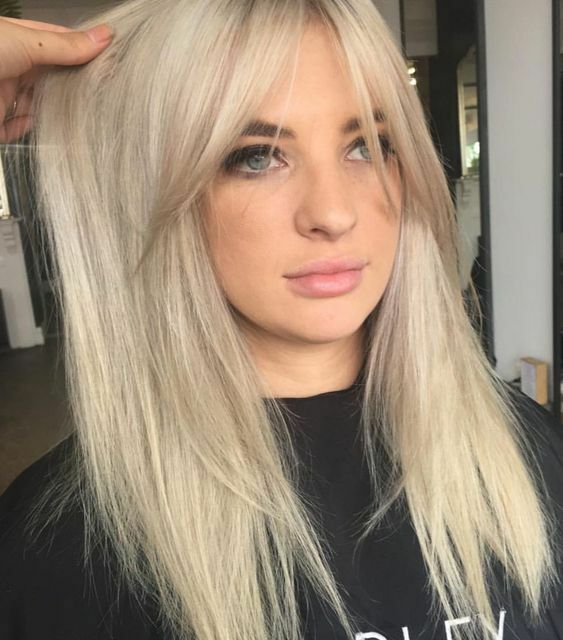 Whilst sleek locks will still be popular in 2019, there will be a huge surge in popularity of matte, messy locks that have a carefree attitude. The cropped bangs are incredibly youthful and the piecey cut of them is so on-trend. Elongate a round face with a choppy bob that hits below the chin, with a blunt finish. 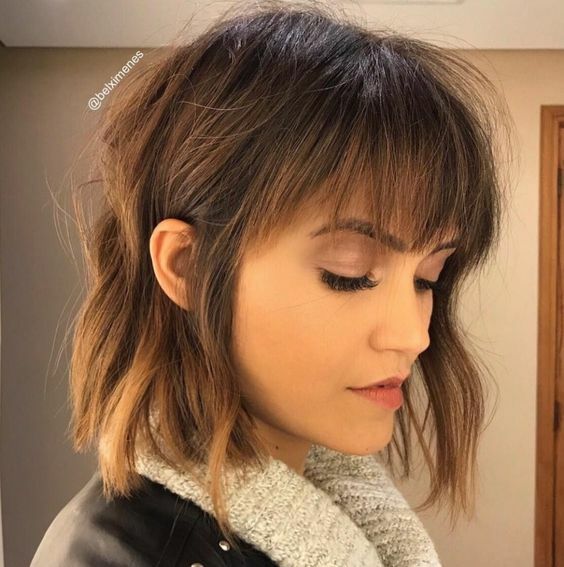 Wispy side-swept bangs will give the choppy bob a softness that is incredibly feminine and beautiful. 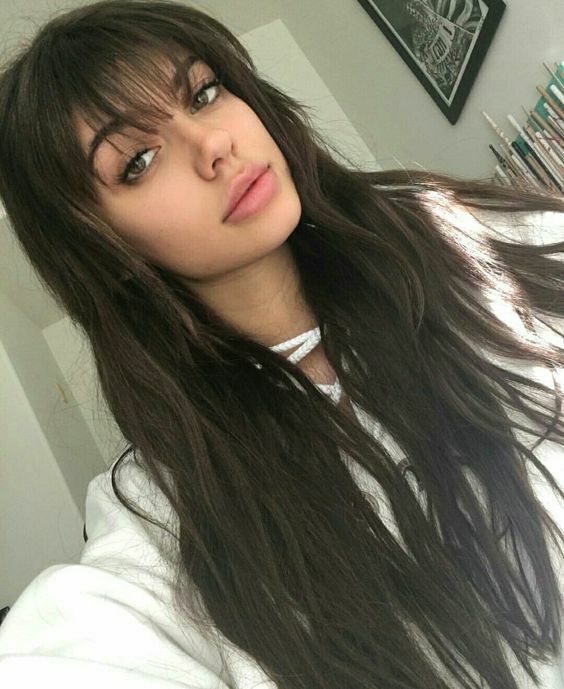 The model has drawn attention to her gorgeous green eyes with eyelash-skimming bangs that are poker straight, yet still bouncy and soft. The long lengths have been styles into a modern half top knot, with the loose locks given a gentle wave. Stunning! 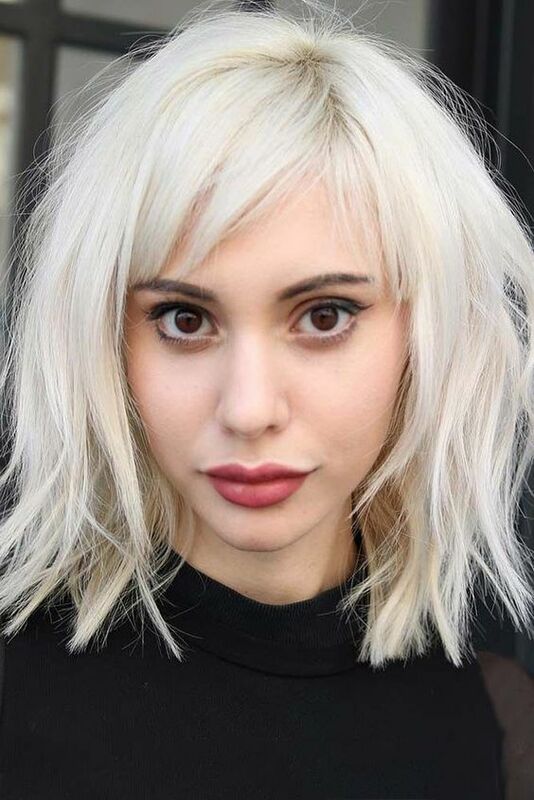 Frame a heart-shaped face with some wispy bangs that are rounded towards the cheekbones. This will emphasise cheekbones, as well as making the eyes pop. 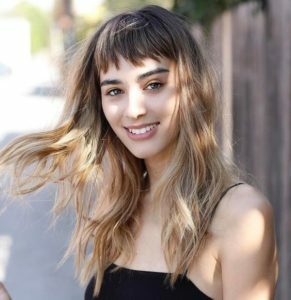 The straight bangs are a great contrast to the wavy locks of the lengths. 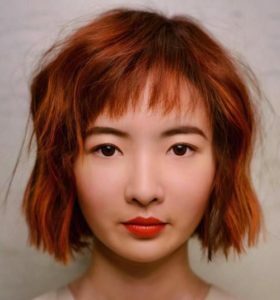 The spicy auburn shade of this blunt bob is beautiful against the model’s beautiful peachy complexion. 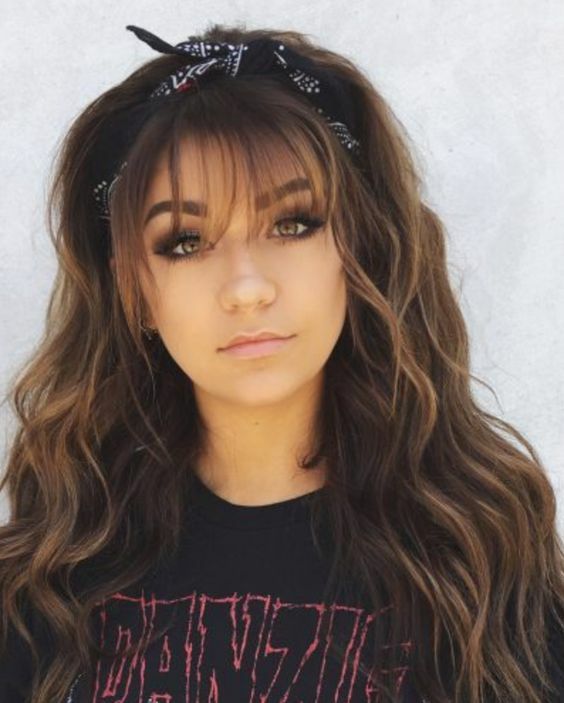 Furthermore, her rounded face has been elongated with the addition of some short choppy bangs that look amazing styled as they are, or would look just as good swept to the side. 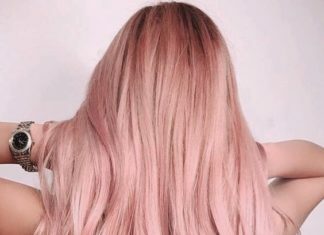 Pink hair, don’t care. These stunning braided space buns have a cool nineties vibe, complete with the escaping tendrils and barely there wispy bangs. A gorgeous show stopper of a look. You don’t need to go through that awkward phase when growing out your bangs, they can still look incredibly beautiful. 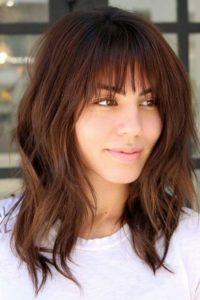 Prevent your grown out wispy bangs from irritating you by using a wide barrelled brush to blow dry them up and away from the face. Hold them in place all day with a light spritz of hairspray – gorgeous! Fine hair has been given movement, volume, and texture thanks to a great layered cut that gives the hair just the right amount of bounce. 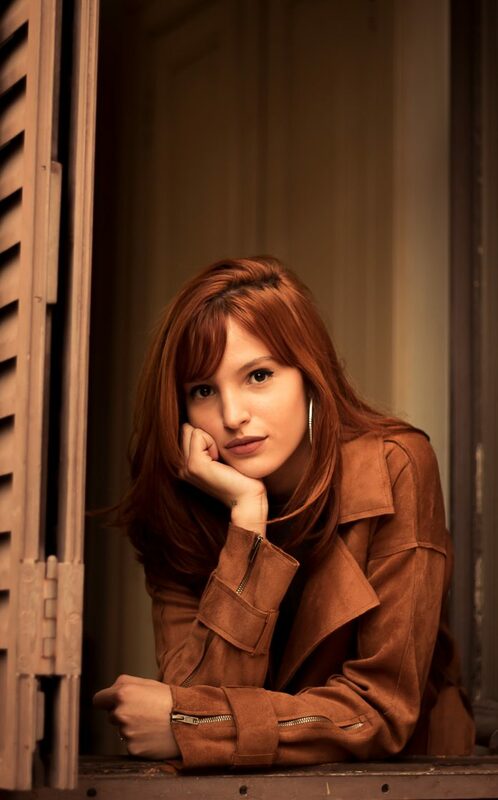 Wispy bangs and layers frame the face and draw attention to the model’s beautiful features. Keep plenty of texture through fine locks with a styling wax used to tease out the layers. A messy up-do with bangs can look incredibly sophisticated. 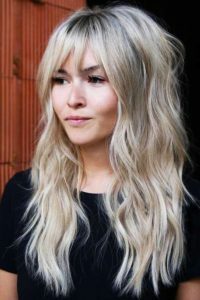 The wispy bangs have been styles incredibly neat and sleek, which makes this look perfect for any occasion, casual or formal. The loose tendrils framing the face are a lovely finishing touch. Add something extra to your A-line bob with some long wispy bangs that are parted in the centre. Longer bangs like these are incredibly versatile as they can be styled into full eyelash-skimming bangs with a barrel brush, worn side-swept, or parted in the centre. Whatever way you wear them, they will look gorgeous. This bob hairstyle is definitely reminiscent of the uber glamorous flapper girls of the 1920s. The super cropped bangs and the short choppy bob with layers feathered towards the cheekbones have such a vintage feel, but the colour and styling are fresh and contemporary. The straw coloured roots and white blonde are just gorgeous. This platinum lob with choppy layers is beautiful and has been given a contemporary touch with some short side-swept bangs. 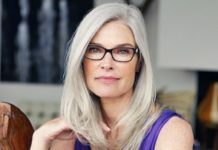 Tease out some texture and define layers by roughing up the hair with some firm hold wax, or simply spray the ends of the hair with a firm hold hairspray and twist sections. 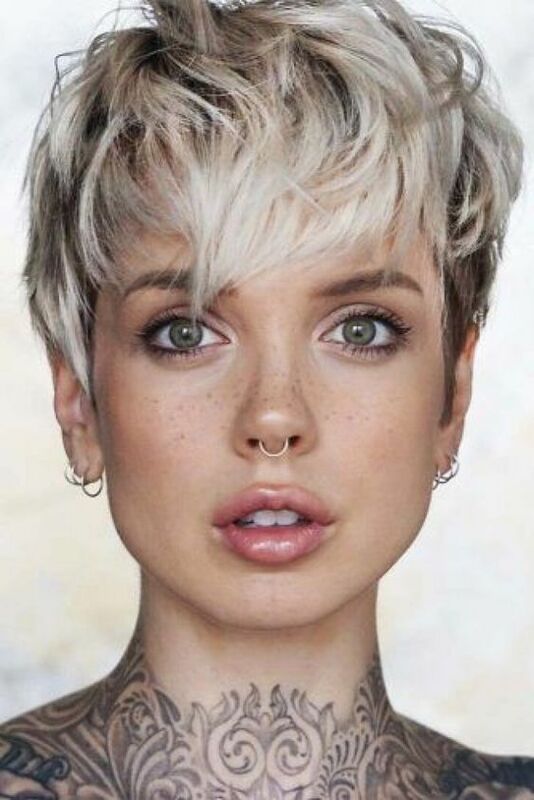 The pixie cut is such a low maintenance hair cut and always looks cool and edgy. Particularly suited for oval faces, this pixie cut has a gorgeous bouncy texture and uneven bangs that have an effortless feel to them. Furthermore, the dark roots are a great way to bring depth to finer hair. 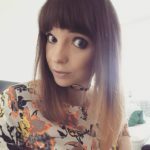 If you have naturally curly hair you don’t need to break out the straighteners every day to style your wispy bangs, they look just as good with even a fairly tight curl. 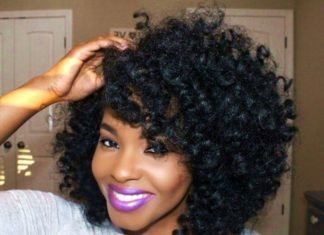 This naturally curly hair up-do is stunning and it is the curly wispy bangs that really take it to the next level – soft and beautiful. Is there a chicer style than the classic messy bun? Probably not, it has a way of looking relaxed and easy, whilst also looking classy and elegant. 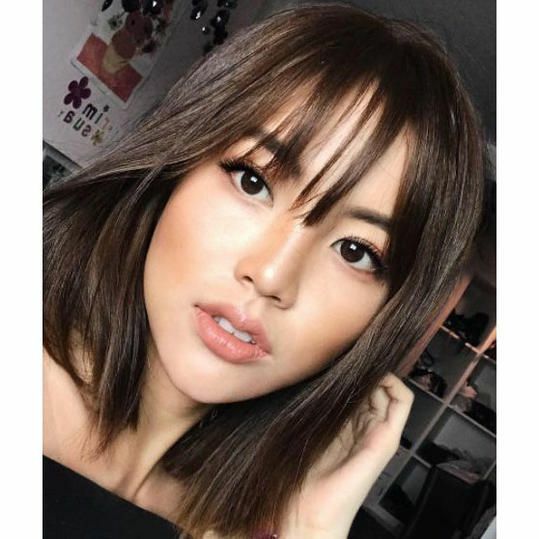 These wispy bangs are smooth and sleek and frame the face beautifully. This would be a great look for all occasions, whether it be a trip to the gym, a night out with friends, or a special date night. 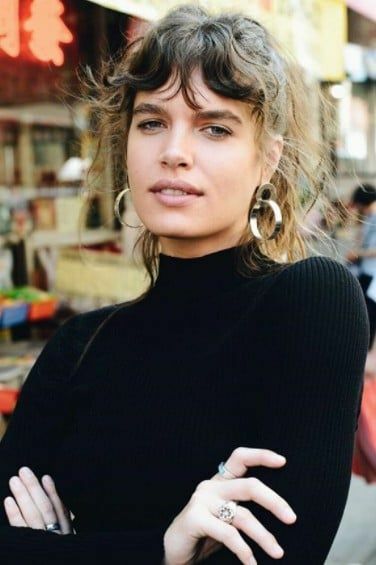 The shag cut that was popular in the 1970s has been making a comeback in recent years. 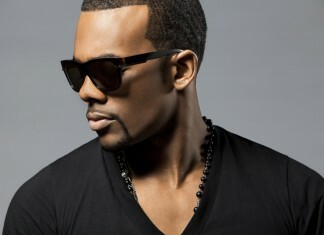 The layered cut looks great when it is styled into tousled waves, which show off the great style to its best. 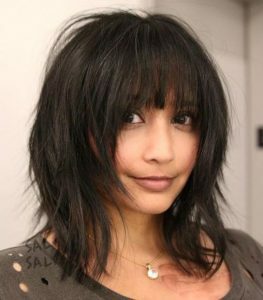 The long, wispy bangs almost cover the eyes, which give a rock chic vibe that is cool and edgy. This hair is giving off seriously beachy vibes, don’t you think. The messy wave, the bright blonde shade, and the parted bangs are all saying ‘summer’. Gorgeous and playful. Piecey bangs are a great way to embrace the wispy bangs trend and they look great with these long wavy locks. The matte texture is beautiful and gives definition to the waves and the light layering through the lengths. These long wispy bangs are so pretty and match the vibes of the messy bun to perfection. The loose tendrils around the hairline are feminine and beautiful, helping to create a relaxed style that is chic and effortless. These locks are so lush and thick and look so beautiful, styled in loose waves. The wispy locks contrast with the full body of the hair and have been emphasised by the cute hair scarf. Just lovely!